They sing the names of god. The names of the gods unlock the shuttered spiritual rooms inside us. Each one a key to a different lock. And when you sing them you invoke them inside yourself. How did I not know this before? Shiva, Ram, Krishna, Govinda, Gopala, Radhe, there are so many. Om is like a sledgehammer beating on the door. These names are lockpicks and keys and screwdrivers for taking your soul apart. They’re the vitamins of the soul, the balanced diet. How did I not know this? Or a better question: why doesn’t everyone know this? Because I did know it, sort of, I just didn’t have an explanation for it. I love kirtan. Have only done it for a couple of hours at a time, but it is the best. And funny how Daron has a similar experience with it in Japan….. around the same time? Keeping checking in to see if we are back to Daron’s. 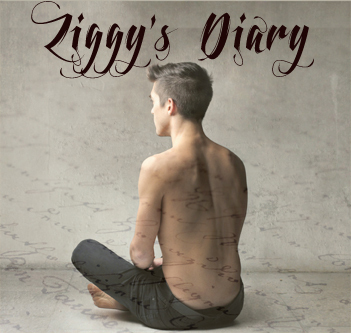 It’s nice to know what Ziggy is up to, but isn’t this suppose to be Daron’s Guitar Chronicles. It’s only Ziggy’s for a month. Check back in about ten days, my friend. This is supposed to be Daron’s coming of age story, coupled with coming out and the best fictional account of eighties rock and roll I’ve ever read. Trust ctan. Ziggy is perhaps the most important element of Daron’s growth and evolution. This stuff is important.